Born and raised in Southeast Portland, Steven represents all that is good in our city: he’s exceptionally friendly, a robust advocate for community organizations, and loves dogs. It may be his desire to be of service that speaks the loudest. 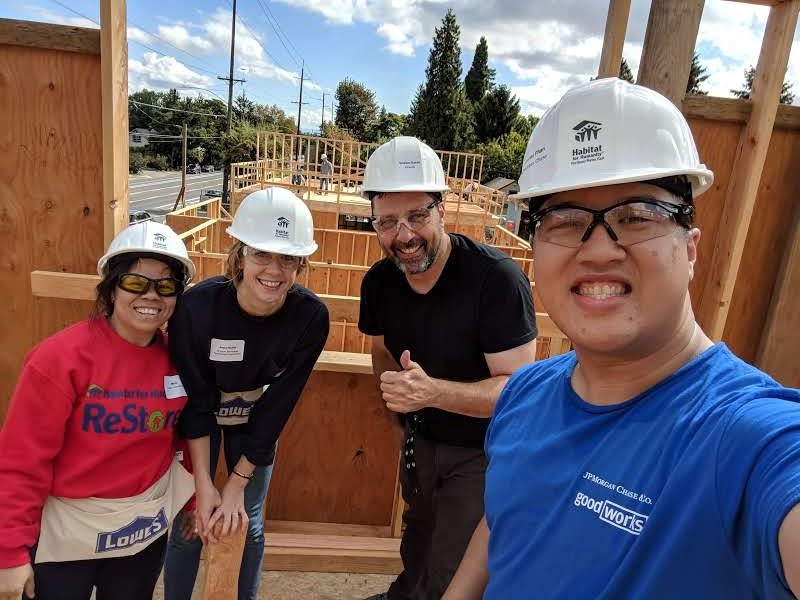 Any day of the week, you can find him volunteering locally – from sorting produce with Oregon Food Bank to planting trees alongside United Way, or raising walls with our construction crew, Steven loves serving his community. This year, he’ll take volunteering with Habitat for Humanity Portland/ Metro East one step further in his repertoire by joining 17 local leaders in the newly-launched Ambassador Council. As Chair, he will lead this coalition in advancing Habitat’s mission through civic engagement. Together, they will strengthen our community and help Habitat make Portland a better city for all–something Steven values deeply. “When you can make a difference in someone else’s life, that’s when you can start to make meaning in your own life,” he said. For Steven, his Habitat experience has now come full circle. He was first introduced to our work during his last year at Benson High School. His senior project for architecture was to design efficient housing for Habitat for Humanity. Little did he know, he would find himself volunteering at our construction sites, building homes alongside local families not a decade later. He said getting to know each homebuyer and building with them is one of the greatest aspects of being a volunteer. As the son of Vietnamese immigrants, he’s witnessed, firsthand, what it means to succeed through perseverance. His mother fled Vietnam and spent time in refugee camps before finding her way to the United States. She did it to protect her family. It’s something Steven still carries with him as he mentors his niece and nephew, instilling family values at a young age. “We have such a strong family because we know what everyone had to do to get here, to work for the opportunities that we have here,” he said. Personal sacrifice goes hand-in-hand with Steven’s success so far. He said his family is the driving force behind all of his decisions. They are the reason he didn’t go to college right away, choosing instead to stay home and help his family re-stabilize during the Great Recession. They are also the reason he postponed his plans to teach, realizing he couldn’t help support his family on a teacher’s income. He started as a teller working at a small bank in Corvallis while earning his Bachelor’s Degree in Human Development and Family Sciences from Oregon State University. Now with an Executive MBA under his belt, Steven works with JP Morgan & Chase as a Client Relationship Manager. He finds joy in getting to know people beyond their finances and counseling them on better practices to help live a more stable life. Driven by the love for his family, he gives back to his city every day. Though his schedule is packed, he deliberately makes time to entrench himself in an array of volunteer opportunities because uplifting the community is important to him. When asked to be the Ambassador Council Chair, he agreed without hesitation. We are so excited to launch Habitat for Humanity Portland Metro/East’s Ambassador Council. This inaugural council is comprised of 17 leaders and rising leaders in the business community helping Habitat to engage like-minded friends and colleagues to explore strategic partnerships, raise funds, and advocate for issues vital to Habitat’s work. We represent a wide array of professions, sectors, and career paths and are passionate about making Portland a better city for all.